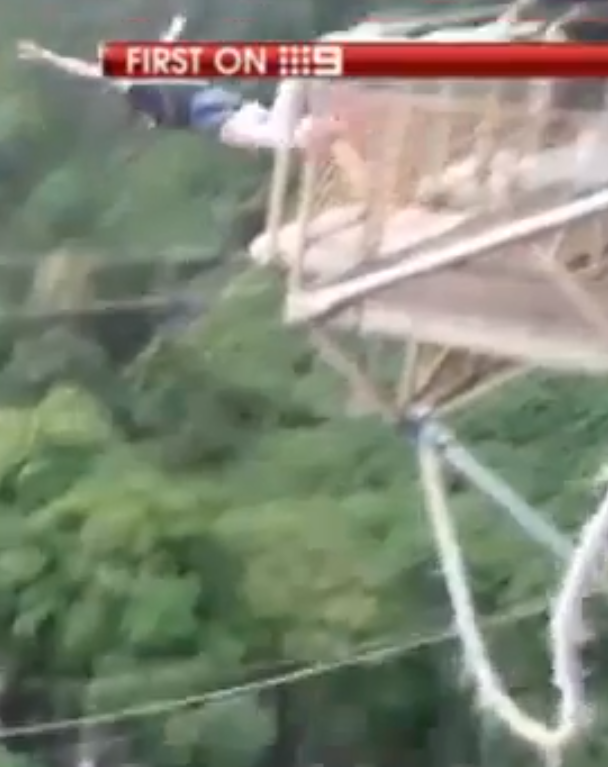 The video of a near tragic bungee jump accident that almost took the life of an Australian tourist in Zambia last week reveals unequivocal negligence by a bungee jump operator who blatantly ignored warning signs that the rope was far beyond it’s safe use period. Everyone involved is lucky that the tourist on the cord when it snapped survived; however the Zambian government is compounding the problem by issuing ridiculous reassurances that all is well, when it obviously is not. First, here is the video. It’s pretty scary but the tourist survived. It doesn’t take an expert to see what the problem is — but since I do have expertise in this area I will explain what it is. One of the curious corners of my past is that I was an owner of a bungee jump in Subic Bay Freeport in the Philippines from 1993-1995, so I know a little something about bungee jumping and bungee cords and bungee safety. If you’ve never seen a bungee cord up close — imagine several hundred rubber bands braided together — that’s all it is. There is no sleeve or casing around it — they come in different thicknesses for different weighted jumpers (I had the honor of test jumping the bungee “large” size bungee cords for our jump, but that’s another story). Over time, individual strands will start breaking and when that happens, you buy a new cord. There is a safe life for a cord — a certain number of jumps, or a certain calendar period. You don’t just using a cord until it breaks. Or you don’t do that unless you’re this particular operator. In the video the bungee cord is visibly frayed and falling apart, not just a little — a lot, all the way up and down from top to bottom — you can see it in the video. There are big clumps of broken strands dangling off the main body of the cord from top to bottom. I don’t know how many jumps it had been used for, but it was clearly long, long past the safe usage period. To put this in perspective, we had to change our cords before there was any substantial, visible fraying of the cord — by contrast, this cord is frayed from top to bottom with huge clumps hanging off. In this shot, just prior to takeoff, the frayed condition of the cord is clearly visible in the lower right corner. You can see how it is coming unraveled throughout. 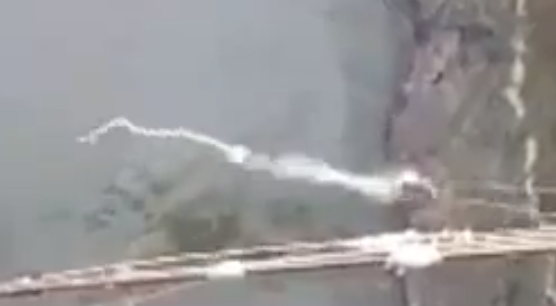 In the early part of the dive, while the cord is still close to the bridge, you can see that it is consistently frayed throughout. This is from moments before the cord snaps. It snaps at the juncture between the juncture of the bungee cord and what appears to be a cable that is attached to it — presumably to extend its length. You can see that it is frayed right up the spot where it snaps. This is at the moment where it snaps. You can see that it basically explodes–and on the sound track you can hear the sound which is basically like 100 rubber bands exploding at once. Meanwhile the Lusaka Times has published the following which shows the government of Zambia is so concerned about tourist dollars that they are willing to remain completely in denial about this situation. GOVERNMENT has assured tourists visiting the Victoria Falls in Livingstone that the bungee jumping equipment at the falls is safe. Minister of Information, Broadcasting and Tourism Given Lubinda said in an interview on Tuesday that tourists should not worry about the equipment as it has proven its reliability over the past years with only one mishap. 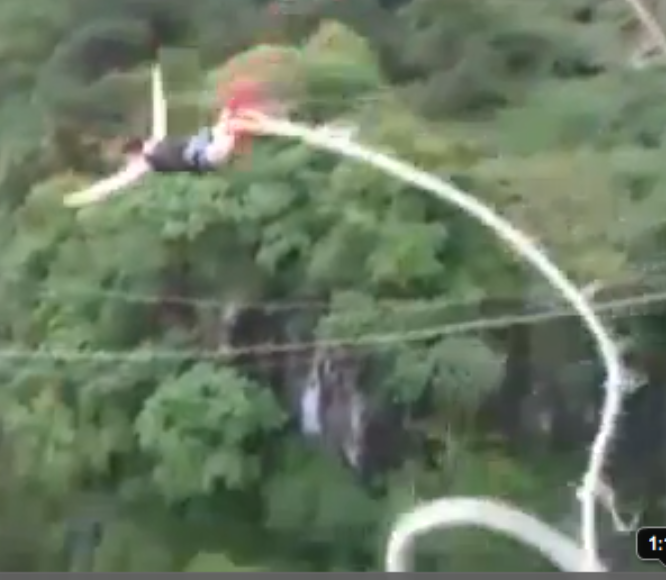 “The bungee has proven to be a very viable operation considering that more than 50,000 tourists jump on it every year. It has been in operation for 10 years. This is the first time I am hearing of an incident. The probability of an incident is one in 500,000 jumps,” he said. 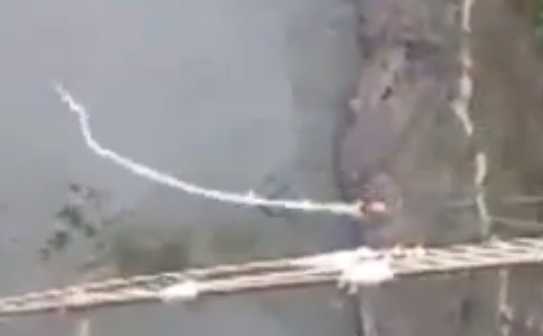 Mr Lubinda was commenting on an incident where a 22-year-old Australian tourist plunged into the Zambezi River on Saturday after the bungee jumping cord snapped. Are you kidding me? Mr. Lubinda look at the tape. Did all 50,000 tourists a year jump on this one cord? For how many years? I know what it’s like in third world countries; I know things tend to be a little looser than elsewhere — I lived in Africa, I get it. But this is not acceptable. The Zambian government needs to take ownership of this and show the international community that they actually do care about the safety of their visitors. Mr. Lubinda — would you like to jump of that bridge on the equipment that’s there now?